We collect and preserve items which hold information about North Devon and the people who have lived here over the centuries and we’ve been doing so for over 170 years. We also have a number of collections on loan with the North Devon Record Office, The Museum of Barnstaple and North Devon and Barnstaple Town Council. We have over 15,000 items on our shelves covering the history of North Devon, the Westcountry and beyond. The Library Collection is the oldest of our collections and has its origins in the foundation of the Barnstaple Literary and Scientific Institution over 170 years ago. In the early days of the institutions many of the items were donated to us by Rock, our Directors & Trustees as well as members of the public. 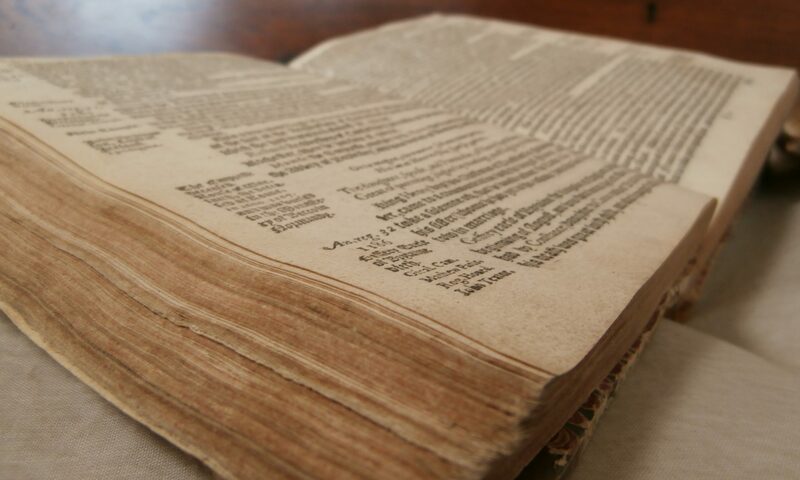 The oldest item on our shelves was published in 1597 and was donated to us by John Roberts Chanter, one of our original directors. We have an extensive collections of local books as well as large collection of more general books which made up part of our original library collection from when we were the only free library in Barnstaple. To find out more about some of the items we have on our shelves visit the Discover…On Our Shelves! series on our blog, Tales From the Archives. There are over 14,000 items in our document collection and many more on loan to the North Devon Record Office. The first collection donated to us was the Harding Collection a glorious collection of notes and ephemera about the parishes, families and churches of Devon and much more. The Lethaby Collection is a collections of notes, drawings and publications by and about Barnstaple born William Richard Lethaby who was an architect and educator who helped establish the Artworkers Guild and the Central School of Arts and was a leading light in the Arts and Crafts Movement. Bruce William Oliver was a local architect and our second benefactor, his collection of drawings and notes gives an insight into the buildings of Barnstaple and North Devon, his photographs and slides can be found in the Image Collection. We have thousands of images of North Devon including images from the early days of photography and much more. Our image collections contains a variety of items from original oil paintings by Joseph Kennedy and Frederick Lee to a huge collection of glass and film negatives from the North Devon Journal Archive. In all there are over 20,000 items listed on our catalogue and thousands more (mainly from the Journal collection) waiting to be processed. This extensive collection captures the landscape of North Devon and the lives of the people who have lived here. First published in 1824, the North Devon Journal newspaper is a mine of information. The North Devon Journal archive is the largest of our collections. The newspaper has been going for nearly 200 years and is a mine of information. We have the original copies of the newspapers first year (1824-25) of publication and a complete run of original papers from 1853-1980. We also have a complete run of the papers on microfilm from 1824-1988 which are kept alongside the Local Studies films, which run from 1989-2014, in the public area of the joint department. In the 1980’s a project under the Man Power Services Commission saw an index to the papers created covering the years 1824/5, 1850-1895. This index can be searched by either subject or surname. More recently volunteers have created an index to the birth, marriage and death notices which is almost complete from 1824-1949. Last but not least we also have the Journal’s negative archive. Thousands of glass and film negatives which were taken for use (or not) in the newspaper from the late 1940s to the early 2000s. So far we have digitised nearly 28,000 of these negatives and there are thousands more to do. For more information about the collections visit our blog – Tales From the Archives – where you can also find some of the stories we have discovered within the pages. We have collections of documents and artefacts on loan to other places. The Museum of Barnstaple and North Devon is based in our old building and look after our museum items, including local pottery, pewter, paintings and lots more. Visit their website for more information. Barnstaple Town Council look after the Prior’s Ring and our collection of Barnstaple Silver Spoons among other items. They are kept alongside the Town Plate in the Guildhall. Visit their website for more details and how to visit.